​To develop a group with a social media networking site such as, Facebook where people around the world can download the image (currently, in draft form seen on the left), which I’ve designed that will become available on this website soon. The image is of a woman bending her naked body into a question mark symbol and the earth as the dot underneath her feet. Then I would like to encourage people to take photographs of this artwork as they are travelling next to buildings (for example, the Opera House in Sydney, The Eiffel Tower in Paris), road signs, trees and so on. Then the next step would be to upload these photographs of the image at various sites to Facebook and for this to go viral & gather and unite a network of supporters worldwide. Therefore, the shrine and memorial is for everyone to take solace in around the world. From the image mentioned above would be to realise it, by developing and translating it into a bronze statue. 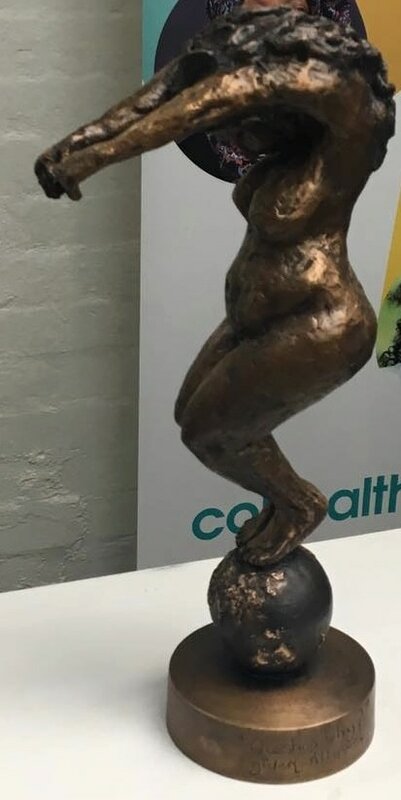 I envisage this statue to travel around as a portable shrine and memorial to represent victims / survivors of private & family violence in art galleries and meeting places to educate people and get them to talk about such a difficult and taboo topic. To develop a monument that represents a shrine and memorial in a tangible public space first in Melbourne and then around the world. Funding to be provided for counselling or therapy and support services; to assist survivors and their friends, carers of family violence and private violence for as long as they require it. Acknowledge survivors and victims of family & private violence by 30 seconds of silence at the beginning or end of a meeting.